- The Tree of Life is a common motif found in many belief systems around the world. It represents the interconnection of all life. This particular version also incorporates a triquetra knot, to symbolize the triple goddess in her forms as maiden, mother, and crone. This pendant measures 1 1/4" in diameter, and hangs from a 33" long black cord. Made of bronze. 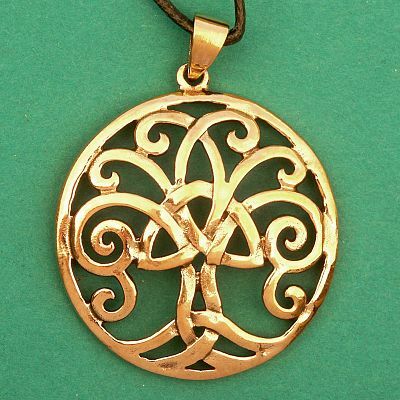 Do you have any other questions about our Bronze Triquetra Tree Pendant?